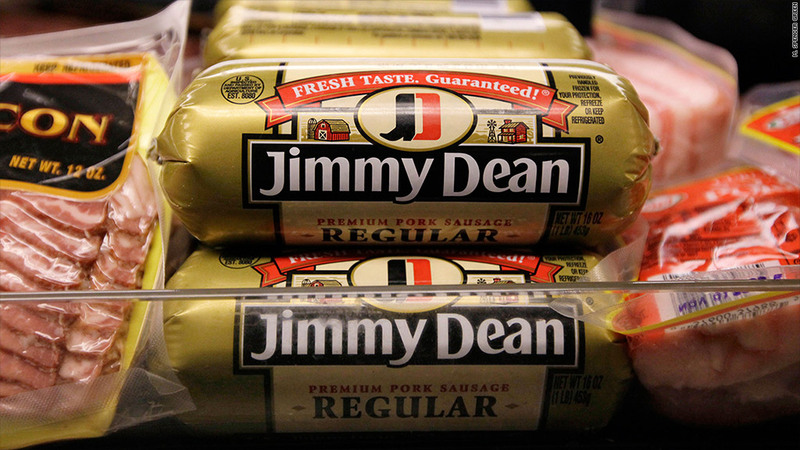 Tyson Foods raised its bid for Hillshire Brands, maker of Jimmy Dean sausages. The food fight over Hillshire Brands appears to be wrapping up Monday as Tyson Foods upped its offer for Hillshire, forcing rival Pilgrim's Pride to drop its bid. Hillshire, whose brands include Jimmy Dean sausages, Ball Park Frank and Sara Lee frozen bakery, has proposed its own purchase of Pinnacle Foods (PF). But last week Hillshire announced its board had authorized talks with both Tyson and Pilgrim's Pride over their interest in the company. Tyson (TSN), which on May 29 had bid $6.8 billion for Hillshire (HSH), upped its all-cash bid to $8.55 billion, or $63 a share Monday. The bid is contingent upon Hillshire dropping its bid for Pinnacle. In response to Tyson's raised offer, Pilgrim's Pride (PPC) pulled out of the bidding war for Hillshire. "As a disciplined acquirer, we determined that it was in the best interests of our shareholders not to increase our proposed price of $55.00 per share in cash," said Pilgrim's CEO Bill Lovette. But Tyson said cost savings from combining with Hillshire will allow it to increase earnings per share in the first full year of the combination, despite the higher acquisition price. "Tyson's shareholders will benefit from the considerable new opportunities that come with this extraordinary strategic fit," said Tyson CEO Donnie Smith. " Hillshire announced a $6.6 billion deal for Pinnacle on May 12, and Pilgrim's Pride announced an unsolicited $6.4 billion offer for the company on May 27. Two days later Tyson joined the fray with its own $6.8 billion offer, which prompted Pilgrim's to up its offer $7.7 billion.